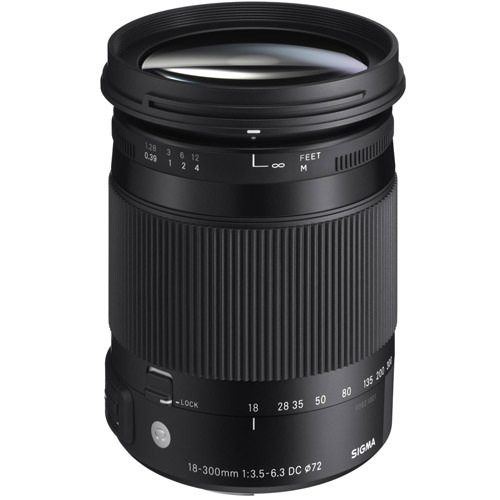 The Sigma 18-300mm 3.5-6.3 DC HSM OS Macro is another impressive addition to the Sigma Global Vision Contemporary line. With a 16.6x zoom ratio covering focal lengths from wide to telephoto, this lens also offers a 1:3 macro ratio. The Sigma 18-300mm Contemporary was designed for APS-C cameras where it equates to a 27-450mm lens and incorporates state-of-the-art Sigma technology. An enhanced optical stabilizer (OS) compensates for camera shake, while an optimized hyper sonic motor (HSM) ensures quiet and fast autofocus. Four FLD (performance equal to fluorite) paired with 1 SLD glass elements capture incredible sharp and contrasted images, all the way through the focal length. Utilizing top quality glass, the Sigma 18-300mm Contemporary controls aberration, even at the telephoto end to produce high quality images. Working with the USB dock, this lens allows for firmware updates when available and adjustment of focus parameters.